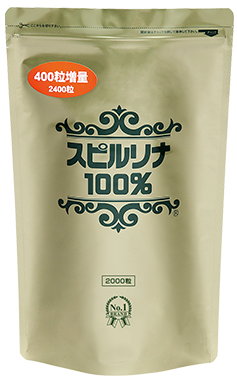 Spirulina is one of the same blue-green algae as Suizenji Nori (seaweed), etc. and it is one of the oldest plants which was born on earth more than 3 billion years ago from now. It is breeding mainly in the subtropical areas such as in Africa, Central and South America, salt water lakes of high alkaline. "Spirulina" is a Latin word meaning "helix", it is said to have been named because it has a twisted shape. Since there are many kinds of nutrients included abundantly, it is a convenient food as a dietary supplement for modern people who tends to take unbalanced meals. As "ideal nutritional food", NASA is also developing it as a space food. Proteins, sugariness, fatty acids, and vitamins, and even minerals, such as calcium, magnesium, iron and zinc that tend to be deficient in everyday diet are abundantly contained. That is, it contains all 5 major nutrients. Furthermore, because digestion absorption is good, these ingredients are absorbed smoothly in the body. All sales by mail order only.